Flowers, sugary treats and a surplus of hearts make an annual appearance on Valentine’s Day. Check out our top 10 Pinterest crafts to make February a month full of creative inspiration and quality time with family and friends. This easy-to-use stamp made of a celery stalk is perfect for little hands to decorate Valentine’s cards and other paper goods. Add glitter to the stamped rosebuds for an extra punch. This simple craft requires items already at home: old crayons, wax paper, and an iron. Heart sun catchers give winter windows a much-needed dose of cheer. Enjoy Valentine’s candy without the accompanying sugar crash. Candies in red and pink hues give old school candy bracelets a Valentine’s Day update. For younger kids, consider puncturing the candies beforehand, so they can simply string them like beads. Put those old wine corks to use and make a festive friend. Googly eyes, bright paper and a short assembly time make lovebugs a hit with toddlers. The loom band trend is still going strong. Check out the tutorial and free printables for woven hearts and creative takes on traditional woven bracelets. Older kids will love making and swapping bracelets with friends. Craft, game, or exercise? Valentine’s hopscotch combines all three for indoor or outdoor fun. This craft can be simplified or amped up with additions like feathers and glitter. Add a message to the arrow tail to make this a Valentine card fit for Cupid’s quiver. What’s a Valentine’s Day without colorful flowers? Skip the florist and go the paper route with this selection of blooms. Show the kitchen a little love and try this baking-crafting hybrid. Fortune cookies are a nice semi-sweet shift away from normal Valentine’s Day treats. If crafts aren’t your thing, these healthy Valentine’s snacks are tasty and creative. This menu is perfect for a Saturday morning breakfast with the family. 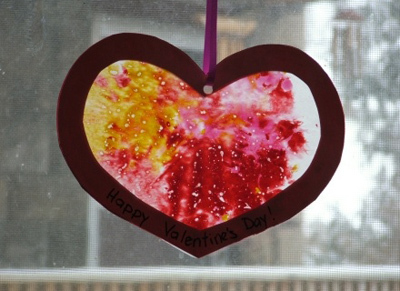 Need more crafty Valentine’s ideas? Check out our Pinterest board here.